This technique will allow you to easily add new user profile fields that your blog’s users can use to input more information about themselves. In this tutorial, I’ll show you how to add an input box for a Twitter username and how to display it on your site. In this article we will show you how you can create a contributors page which will display a list of authors with avatars or userphoto and any other information that you like. The user profile of WordPress can be fairly easily adapted to add your own values​​. So you can add the necessary custom fields according to your requirements. Here is how you do it. Most free themes do not have a custom author.php file, WordPress automatically callback to archive.php or index.php when someone views the author profile page. The problem with that is that it will only list all the posts written by the author, and it provides no personal information about the author. It is recommended that you copy your archive.php and save it as author.php and modify it. obdobně funkce get user by. Magically uncensor any website on the internet from your own WordPress installation. This plugin makes it dead easy to uncensor blocked websites. In just a few clicks people can setup their own proxy site with the popular blogging software. An essential tool for people whose speech is restricted by oppressive regimes, and handy for downloaders in The Netherlands, Italy, Finland and other countries where ISPs are blocking The Pirate Bay. Widgets are small pieces of content that can be placed in one of the widgetized regions of your WordPress theme. A widget may contain some simple static content like a newsletter subscription form, introductory text, advertisements or some dynamic content such as a list of recent tweets from your Twitter account. With multisite installation you can set up multiple blogs that share the same WordPress files, DB, plugins, themes. Protože WPML plugin pro jazykové verze webů je nadále už k dispozici jen v komerční verzi, a u starších verzí WPML na posledních verzích WordPressu jsme zaznamenali problémy (např. zdvojování části URL), hodí se multisite instalace velmi dobře například jako náhrada WPML pro provoz jazykových verzí. Použito (mj.) na webu opavské jazykové školy Primalingua. In your Tools menu in the left sidebar, you’ll now see the Network Setup item. Click on that and then go to Create a Network of WordPress Sites. Follow the directions and choose a few options such as the URL structure and network name. You’ll then be prompted to make a blogs.dir directory in /wp-content and it will provide several more lines of code to add to the wp-config.php file. It will also tell you to add some rules to .htaccess, a server text file used to work with permissions and configurations for each directory. When you log into the Network Admin, you’ll now see a My Sites item, where you can manage all the network sites. Hover over that, and under “Network Admin”, there will be several administration items. When you click on Sites, you can add new sites with the click of a button! A WP network can manage any number of sites on different domains, sub-domains or paths. However, they must all reside on the same server. The NS Cloner saves multisite admins LOTS of time by enabling them to clone existing sites in their network to a completely new site in a few seconds. 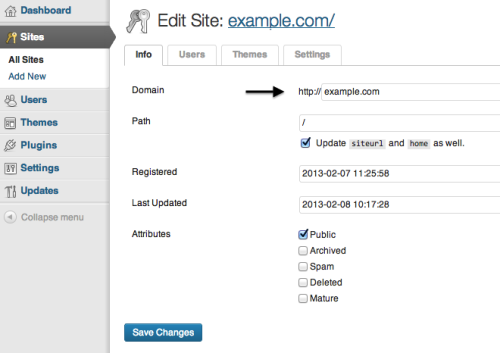 This plugin allows users of a WordPress MU site or WordPress 3.0 network to map their blog/site to another domain. You don’t need to use the domain mapping plugin if you are planning on running a WordPress Multisite with top-level domains and/or sudomains. WordPress allows you to change the domain from a sub-domain to a top level domain once you have added the site. Otherwise WordPress will always set it to your network’s $current_site->domain and you won’t be able to login into any of the other sites.